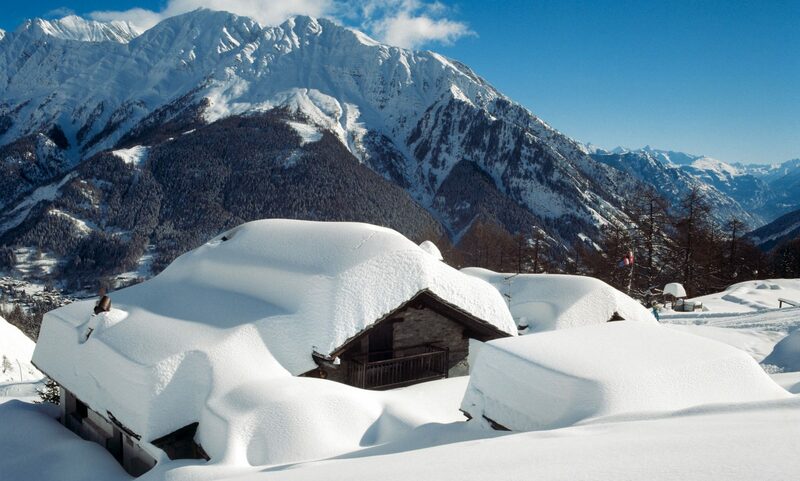 Zermatt, Andermatt and Davos affected with massive snowstorms. The avalanche risk due to massive snowstorms have again prevented the access by road and rail to Zermatt ski resort. SWI – swissinfo.ch informs that Andermatt and Davos are also affected. The police of Valais has asked everyone not to travel unless necessary in its territory. The Insitute of Investigation of Snow and Avalanches had elevated the danger of avalanches to the maximum level (5 “very high”) in all the north Cordillera of the Swiss Alps. A combination of very heavy precipitations and winds up to 130 km/h in the mountains have created a very insecure scenario for travel. In the low lands, very big precipitations have considerably increased the risk of flooding and mudslides. If you need to travel in the mountains, you can check our tips here. The risk of avalanches (in the picture black and red, is level 5, the maximum) by this morning. Now is not the time to go skiing off-piste please – you can check another grim article we covered on avalanche deaths in this region in Switzerland here. Nine thousand tourists in Zermatt have been isolated since Saturday night and will have to wait until tonight (Monday 22nd) to be able to get out of the place. The helicopter services were very busy. A trip to get out of this city costs CHF 70 (USD 72.8) per person, but the bad visibility and the big demand have made a long wait for those that are trying to get out of Zermatt using this service. Andermatt, another ski resort in the centre of Switzerland, has also got isolated on Sunday night. Davos, which is waiting for all the world leaders to gather for their annual World Economic Forum has been also affected by this massive snowstorms. The authorities have asked residents of approximately 30 properties to please evacuate to a more secure place. Thousands of people are trapped in the Swiss Alpine village of Zermatt after heavy snow blocked blocked roads and rail for a second time in two weeks.The luxury ski resort near the famed Matterhorn peak is again cut off to traffic, with authorities citing risk of avalanches as reason for closing roads and rail. Local authorities reported that land access to the village of Zermatt would be closed down throughout Monday, but that helicopters were still taking people in and out. Zermatt is since Saturday 20th January 2018, 10.00 pm not accessible. Due to avalanche danger the road and the railway line between Stalden and Zermatt are closed. An arrival is therefore currently not possible. The duration of the closing of road and train is not yet known. There is no danger for guests and locals in Zermatt. Zermatt has the privilege to collaborate with our own, local helicopter company Air Zermatt. This enables us to provide a heli-shuttle in situations like today. We are the only Swiss tourism destination that has this infrastructure. Snowfall and poor visibility have made flights impossible for a long time. For the low-flying helicopters there was a danger of avalanches. The road from St. Niklaus to Täsch was closed due to avalanche danger. As a result, the flights had to go to Stalden. Therefore, the flight time was extended by 20 minutes (per rotation); according to that, the hourly capacity was reduced. Due to the mentioned circumstances, only 30 persons were transported out of Zermatt. 250 people, who were blocked in Täsch yesterday, were flown in to Zermatt. We regret that the waiting time for many guests willing to leave has taken a long time. This is an exceptional situation which was also very demanding for us. We apologize for the circumstances that led to the delay. The road and railway line will also be closed all day tomorrow Tuesday, 23rd January 2018. That is why Air Zermatt will continue to offer heli-shuttles. However, the helicopters will be available at 11 am at the earliest, as there are avalanche blasts and reconnaissance flights ahead of us. For capacity reasons, we will not be able to fly out all of the guests willing to leave tomorrow. Therefore, no new numbers are issued. The exact capacity depends on the number of helicopters and the length of the flight route. The landing location depends on the road condition. If the road between St. Niklaus and Täsch will still be closed, private cars parked in Täsch cannot be picked up. For all guests who do not necessarily have to leave, we recommend enjoying the better weather and the many snowfalls in Zermatt. Zermatt this morning – photo from the Zermatt’s Facebook page. Due to the changing weather conditions and the beginning of dusk the heli-shuttle will be stopped. No more flight numbers will be issued from now on. Guests with an existing flight number will receive information about the flight schedule via the Liveticker. Guests with no flight number are asked to wait for the latest news on Wednesday morning. Thank you for your understanding. Addition: Due to the closed road and railway the flights now have to be carried out to Stalden. Therefore the flights take longer and the capacity is reduced. Due to the danger of avalanches, the road between Stalden and St. Niklaus will be closed from 3.30 pm. The road and the railway line Zermatt-Täsch will be opened at the earliest on Wednesday morning, 24th January 2018. Guests arriving in Täsch will be flown in from now on. Hosts are requested to pick up the guests on the “Obere Matten”. All guests with flight number 01-30 now enter the counter hall of the Gornergrat Bahn as soon as possible. The shuttle helicopter will be launched shortly. Because of the closed road between Täsch and Herbrigen the flights run between Zermatt-Stalden. It is not possible to pick up the car in Täsch today. Due to avalanche danger the road and the railway line between St. Niklaus and Zermatt are closed. An arrival is therefore currently not possible. What this means for the implementation of the helicopter shuttle is in clarification. According to the weather forecast, Air Zermatt can operate shuttle flights today. In order to avoid further waiting times for guests, Zermatt Tourism distributes departure numbers for the flights from Zermatt to Täsch (but not for the flights from Täsch to Zermatt). The numbers which are in turn are called up on the live ticker. from 401: flights not earlier than tomorrow Tuesday, 11.00 am. For safety reasons, on Tuesday 23rd January 2018 in the morning, the helicopters must be used for avalanche blasting. Shuttle flights are available from 11.00 am at the earliest. The infrastructure for the heli shuttle is prepared. However, the weather currently does not allow any flights (due to visibility and snow fall). Next information will be at 2.00 pm. Due to the current avalanche situation, guests and locals are asked to stay in their buildings or in the village centre. All winter hiking trails and the entire ski area are closed. Please be aware of blocked areas and do not enter them. Thank you for your comprehension. All winter hiking trails are closed. For safety reasons, the ski resort is closed all day. The road Furi-Zermatt is expected to be closed until Wednesday, 24.01.2018. The red bus line (Winkelmatten) remains set until further notice. The green bus line (ski bus) drives, but greatly reduced. Parents are asked not to let children play in the snow unattended, because of the heavy snow masses children may lose their orientation in the snow, which can lead to dangerous accidents. At least until 11.00 am it is not possible to put the heli-shuttle into operation. Reasons: poor visibility, dust avalanches. Individual reconnaissance flights for safety will take place. Further information follows. Good morning Zermatt – a new day in winter wonderland! It has snowed a lot again, the avalanche danger is currently at level 5 (very high). We will inform you quickly and up to date about the situation on this channel. The latest information about the situation can be found in the following liveticker. The next update will follow tomorrow morning. The railway line between Zermatt and Täsch and the road between Zermatt and Täsch remain closed at least until Tuesday morning, 23.1.2018. If the weather allows, a heli shuttle between Zermatt and Täsch will be put into operation tomorrow. It is possible that the heli shuttle has to be set in the meantime. Requirements for flying are: sufficient visibility for the pilots and an open road between Visp-Täsch. As soon as it is confirmed that the heli shuttle will be put into operation (at earliest from 9.00 am), the tourist office will issue numbers with the departure time. Transport to the heliport is only possible with the official bus from the train station square. The flight costs CHF 70 / Pax (EUR 60). The starting up of the heli shuttle and any interruptions and changes to the times will be published on the liveticker www.zermatt.ch/en/liveticker and communicated in the tourist office. To keep on reading ski news at your fingertips, keep on checking on The-Ski-Guru.